This time last year Sports Direct shares were trading at over £8 each as the retailer’s board prepared for the company’s annual general meeting at its Shirebrook HQ in Derbyshire. The board no doubt thought it could shrug off a Unite demo involving campaigners dressed in Victorian garb and a looming vote on the re-election of its chair Keith Hellawell at the AGM. But it failed to heed the warning signs. Fast forward a year to this year’s AGM and the board and Sports Direct’s majority shareholder Mike Ashley face a clamour of pressure from high profile investors over corporate governance and work practices. It has been a torrid year for the retailer, which has achieved a unique feat in uniting the City, politicians and Unite in the need for Sports Direct to address deep seated problems with “Victorian” work practices and corporate governance. Throughout those 12 months Unite has led a campaign against Sports Direct’s shameful work practices at its massive Shirebrook warehouse. Staffed by over 3,500 agency workers, employed through Transline and The Best Connection, and with a directly employed workforce of just under 200, conditions in the warehouse have been likened to a prison camp or a workhouse. It’s been no coincidence that as troubles have mounted for Sports Direct and the scale of the abuse has been exposed that its share price has plunged to around £3 per share and it now languishes outside the FTSE 100. 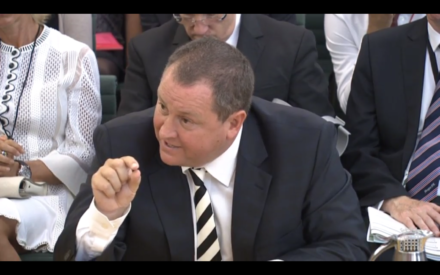 Hauled in front of the House of Commons business, innovation and skills committee, Mike Ashley was confronted by Unite’s damning evidence and forced to admit publicly that Sports Direct hadn’t paid the minimum wage after an undercover report by The Guardian. That admission enabled Unite to secure over £1m in back pay for warehouse workers at Shirebrook. Not just for Sports Direct’s directly employed workforce for whom Unite has union recognition, but importantly for the thousands of agency workers, denied union recognition who toil away every day of the year apart from Christmas. But the victory over back pay is just one part of the story. While significant, it is only one of a number of steps needed to put right a series of abuses in a work place which would feel more at home in a Dickens novel than 21st century Britain. These abuses range from a draconian “six strikes and you’re out” policy, to money being deducted from agency workers’ pay packets for so-called “insurance services” to workers being charged for accessing their own hard earned cash because their wages are paid onto payment cards. That is before you get on to an accident rate, which means you are three times more likely to be injured working at Shirebrook than in agriculture – statistically the most dangerous industry in the UK, or the reports of ambulance call outs for women experiencing pregnancy difficulties. It is highly debatable whether the review by Mike Ashley’s lawyers, RPC, will expunge this dark heart that has been exposed by Unite and blackened the Sports Direct name, thrusting Mike Ashley into the limelight for all the wrong reasons. Investors know it, Unite knows it and politicians know it. The problems run deeper, from the retailer’s addiction to zero hour contracts in its stores to the behaviour of the two employment agencies, The Best Connection and Transline. Sports Direct gives them an estimated £50m a year to run Shirebrook and part of the Transline group had its licence to operate in the food industry stripped from it by the Gangmasters Licensing Authority (GLA) in 2014. The remit of the GLA will be extended to cover employment agencies in other sectors of the economy, including warehousing, from October. This move, a key recommendation in Unite’s evidence to the BIS committee, should not be understated. Provided the GLA is properly resourced, and given additional teeth, then the Translines of this world face greater scrutiny and, with it, businesses like Sports Direct face continued exposure to reputational risk. If Mike Ashley is serious about meeting his promise of making Sports Direct an “exemplar” employer then he can remove this further reputational risk by ditching Transline and The Best Connection. He and the board at Sports Direct could put in place framework agreements to move agency workers on to permanent, direct contracts with Sports Direct and pay the real living wage as a signal of intent. Unite is ready and willing to work constructively with Sports Direct to make this happen, but action is needed, not open days which pretend “everything is ok”. A commitment to confront the real deep-seated problems that remain is needed for Sports Direct to begin to repair confidence and its battered reputation. Twelve months ago, at the last Sports Direct AGM, Unite’s Victorian-themed protest marked the beginning of a stepping up of our campaign to restore dignity and respect to the retailer’s workplace. It’s a campaign which has embraced a broad coalition and a range of tactics involving Unite Community members, football fans on the terraces, the media, shareholders, politicians and customers. As the Sports Direct board prepares for this year’s AGM the voices for change have grown louder and the numbers of concerned shareholders grown bigger. With major players in the City signalling their discontent and backing the Trade Union Share Owners (TUSO) resolution on work practices, it is a call for reform which is unprecedented in its make-up and a call Mike Ashley and the whole Sports Direct board would do well to heed. Steve Turner is assistant general secretary of Unite. Steve Turner is assistant general secretary of Unite the Union and national chair of the People's Assembly.